Every year I have the kids help with Christmas Presents for our family.It seems to give them a sense of ownership in the giving process, and in turn giving them experience of the joy of giving. The materials I used were all art materials I already had in my house. We may not have spent a lot of money on these, but the couple of hours that went into them was part of the gift we gave to our friends and family. After we explored with green paint I helped the boys make some handprints that were used for labels for our annual puppy chow bags. Daddy made the puppy chow this year because I was sick and didn't wan to infect out entire extended family! 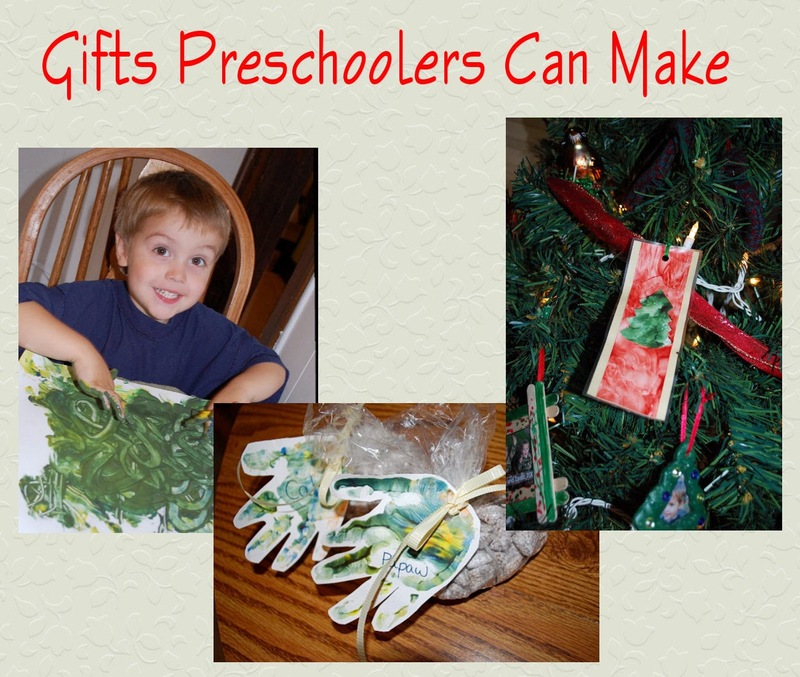 We first started our 2010 Kid-Made Christmas Projects with SEVERAL finger-painting sessions. I would not recommend trying this all in one session, or you will burn out your kids and yourself. For a really cute addition, print pictures of your kids fingerprinting to include with the bookmark. We didn't have green finger paint, so it was a great time to learn how yellow and blue make green. Just let the kids explore the paint. Let dry and cut out trees. On a different day, we did some Easel Painting for the backdrop of our our ornaments. You can just as easily do some red finger-painting to do the background, but I found this great easel at Goodwill and the boys love any excuse to paint with it. I finished the bookmark/ornaments by mounting them on construction paper, putting contact paper over each one, then attaching some embroidery thread we already had in the house.